What is the Active Suspension System or Adaptive suspension? The automotive suspension system helps to reduce the body roll and improve the ride quality effectively. However, the system which actively controls the vertical movement of the wheels corresponding to the vehicle chassis (vehicle’s body) thru’ a computer-controlled system is known as the Active Suspension or Adaptive Suspension. It offers a more refined and smooth riding experience. In the passive/conventional suspension system, the profile of the road alone decides or affects the entire movement of the suspension system. The active system came into existence more than two decades ago. Formula One’s racing Team Lotus first employed the active suspension. However, it had numerous problems such as excessive noise, vibrations, and harshness. It also had excessive power consumption issue. The manufacturing cost was also very high. So, the manufacturers were reluctant to implement it in passenger cars. Generally, this system has two main categories: The purely active suspensions and semi-active/adaptive suspension. The active system can be further divided into sub-categories. It uses a kind of actuator which helps in raising or lowering the chassis/body independently at each wheel. However, the semi-active suspension can only vary the firmness of shock absorbers in order to suit the changing driving conditions. Furthermore, the purely active system works on either hydraulically actuated or an electromagnetic recuperative mechanism. Whereas, the semi-active suspension operates either thru’ the solenoid/valve or uses magneto-rheological damper mechanism. The active system offers a greater level of ride quality and handling of the car. It does so by keeping the tires at right angles to the road in corners which gives better traction control. Furthermore, with the help of an onboard computer, the system detects the vehicle body movement thru’ many sensors installed on the vehicle body. The onboard computer controls the action of the suspension by using the data calculated by appropriate control techniques. Thus, this system can almost eliminate the body roll and pitching variations in numerous driving conditions such as while braking, cornering and accelerating. It gives the passengers a fatigue-free traveling experience. Nowadays, the manufacturers offer the active system on luxury models. They use custom acronyms to differentiate their system from others. Nissan’s Active Ride Control is one such type of suspension system. Read more about Nissan Active Ride Control here. 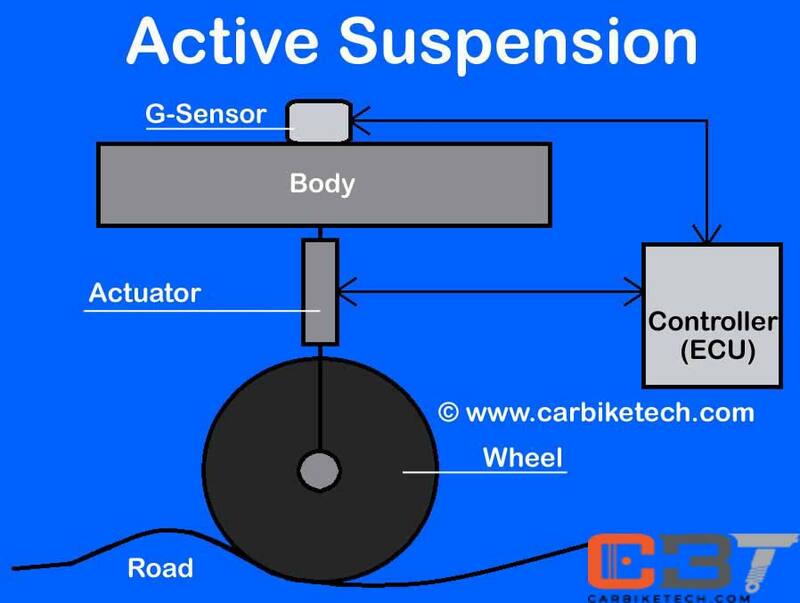 Home » Technical Anatomy » What Is Active Suspension or Adaptive Suspension?